* Please note Chemistry is required as a prerequisite for several advanced science options. 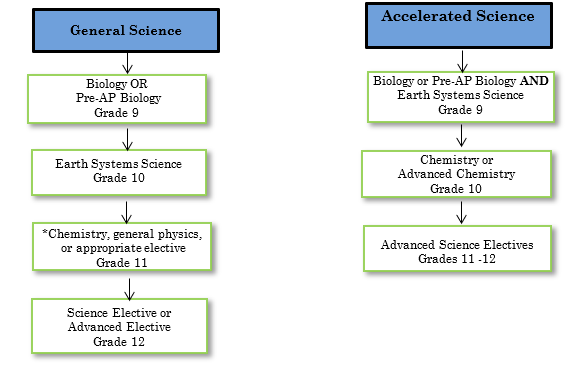 All students are required to take both Biology (or Pre-AP Biology) and Earth Systems in order to meet the required state standards. These two courses are also foundational for all other science courses. Students in any pathway may take more than one science class per year provided appropriate prerequisites have been met. 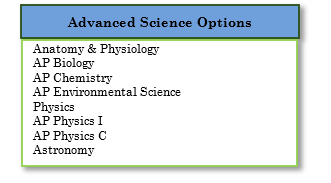 All students are required to take at least 3-years of science: there are additional science courses not listed for the student who has difficulty meeting the 3rd year requirement. Incoming 9th graders who choose an accelerated option should have advanced math skills (completed Algebra 1 or higher), plan on taking more than 40 credits of science, have excellent academic skills and a strong work ethic. Biology is a standards based life science course that explores the interactions of the living world. This course illustrates the relevance and impact of science in society, while engaging students in the mastery of basic biology concepts that will prepare them for higher level life sciences. Topics of study include cell structure and function, genetics, biotechnology, evolution, ecology, and other various topics. At FRHS: Students will participate in laboratory based activities. Pre-AP Biology is a standards based life science course that explores the interactions of the living world. This course illustrates the relevance and impact of science in society, while engaging students in the mastery of basic biology concepts that will prepare them for higher level life sciences. Topics of study include cell structure and function, genetics, evolution, ecology, and other various topics. The course includes more rigorous reading and intensive lab work that is intended to prepare students, in skill and content knowledge, to take Advanced Placement Biology. At FRHS this is a high-level class that requires exceptional motivation and interest in the sciences. Student must also demonstrate high level technical reading and writing skills for lab reports and assignments. Students will be expected to spend at least 3-5 hours per week learning independently and mastering content outside of class. This class is not required to take AP Biology. It is strongly recommended that a student earned an “A” in 8th grade science and is a very motivated science student. Earth Systems Science (ESS) is a standards-based physical science course that explores the interactions of the various spheres of Earth (atmosphere, hydrosphere, geosphere, and exosphere) as a dynamic, evolving system. This course illustrates the relevance and impact of science in society, while engaging students in the mastery of basic physics and chemistry concepts that will prepare them for higher level physical sciences. At FRHS, this is a valuable standards based course designed to provide students with the necessary process, scientific reasoning, laboratory and 21st Century skills that are critical for development of scientific literacy. Students will also apply knowledge to address local and global scientific issues. Students who can demonstrate strong science skills and earth systems science content knowledge on a placement test given during the prior spring semester will be able to enroll in higher level science courses. AP Biology, as designed by the College Board, is a rich and challenging class for highly motivated students in life sciences. The rigor of this class stems from the depth of content, as well as its emphasis on the scientific process through completion of several college laboratories. Students will use a college textbook and supplementary material to study four main concepts focused on the processes of evolution driving the diversity & unity of life, how biological systems utilize molecular building blocks, how living systems store, retrieve, transmit, & respond to information, & the interactions of biological systems. Successful performance on the national AP Biology exam may result in the granting of college credit at many universities. This upper level course is an in-depth study of the major human systems, their structure, functions, integrations of all systems, clinical applications, health and wellness, and mechanisms for maintaining homeostasis. The course also introduces common human disease processes. The laboratory component includes anatomical studies using microscopy, dissection, and the study of physiological concepts via experimentation. Zoology students study the major phyla of the animal kingdom. Life cycles, anatomy and physiology, reproduction, ecology, and economic benefits are emphasized. Correlated sciences would include entomology, herpetology, mammalogy, parasitology, and ornithology. This class should appeal not only to students who desire a career in biology, but also for others who have an interest in learning about the natural world around them. Laboratory dissections are a required component of this class. **At FRHS Zoology and Botany and Microbiology are merged into one integrated yearlong course. Chemistry is a two-term laboratory class exploring the interactions of matter. Units of study include atomic structure, stoichiometry, nomenclature, chemical bonding, gases, and acids and bases. Its approach also emphasizes rigorous problem solving skills and quantitative laboratory work necessary for college. At FRHS this course is inquiry based course that utilizes an on-line homework program called CALM. **There is a course fee for the class course workbook. AP Chemistry, as designed by the College Board, is a rich and challenging class for highly motivated students in chemistry. The rigor of this class stems from the depth of content, as well as its emphasis on the scientific process through completion of several college laboratories. Students will use a college textbook and supplementary material to study chemical kinetics and equilibrium, acid base chemistry, electrochemistry, thermodynamics, and other miscellaneous topics. Successful performance on the national AP Chemistry exam may result in the granting of college credit at many universities. At FRHS Students must have access to a computer and internet for successful completion of course work. Physics is a laboratory course exploring the interactions of energy and matter. Units of study include forces, motion, energy waves, sound, light and introductions to electricity and modern physics. Its approach also emphasizes rigorous problem solving skills and quantitative laboratory work necessary for college. AP Physics 1 is equivalent to a first-semester college course in algebra-based physics designed by the College Board. It is a rich and challenging class for highly motivated students in physics. The rigor of this class stems from the depth of content, as well as its emphasis on the scientific process through completion of several college laboratories. Students will use a college textbook and supplementary material to cover Newtonian mechanics (including dynamics and angular momentum); work, energy, and power; mechanical waves and sound. It will also introduce electric circuits. Successful performance on the national AP Physics exam may result in the granting of college credit at many universities. AP Physics C is a calculus based course designed by the College Board. It is a rich and challenging class for highly motivated students in physics. The rigor of this class stems from the depth of content as well as its emphasis on the scientific process through completion of several college laboratories. Students will use a college textbook and supplementary material to study mechanics, electricity and magnetism, and other miscellaneous topics. Successful performance on the national AP Physics exam may result in the granting of college credit at many universities. Environmental Science is a course designed for the student who is interested in local, national, and global environmental issues. Topics of instruction may include ecology, biomes, energy utilization and alternate energy sources, land use patterns, pollution, population, and analysis of environmental problems. At FRHS Environmental Science is a laboratory based course. It is NOT recommended that a student take BOTH Environmental Science and AP Environmental Science. Astronomy goes beyond what is offered in Earth Systems Science and Geospace. Topics include the history of astronomy, observational astronomy and mathematics, telescope fundamentals and design, space exploration, the solar system, star evolution, galaxy evolution, and the history and future of the Universe. Good math skills are required. Students will be performing laboratory based activities. Students may have an opportunity to attend evening and early morning observations at the school, as well as field trips to local observatories and planetariums. Students will also run state-of-the-art CCD telescope cameras via the internet to image objects of their choice. AP Environmental Science, as designed by the College Board, is a rich and challenging class for highly motivated students interested in environmental science. The rigor of this class stems from the depth of content, as well as its emphasis on the scientific process through completion of several college laboratories. Students will use a college textbook and supplementary material to study concepts and methodologies to understand the interrelationships of the natural world, to identify and analyze environmental problems both natural and human-made, to evaluate the relative risks associated with these problems, and to examine the alternative solutions for resolving and/or preventing them. Successful performance on the national AP Environmental Science exam may result in the granting of college credit at many universities. Biotechnology uses a hands-on approach to explore the use of DNA technology in medicine, agriculture, law enforcement, and industry. This class is designed to introduce students to various lab techniques utilized in the life sciences. Students will complete labs in microbiology, use state of the art technology to isolate and manipulate DNA, and practice techniques used in crime scene investigation. **At FRHS, Biotechnology and Cell Biology and Genetics are merged into one integrated yearlong course.